If you want to attend this seminar you must sign up on the website now before Sunday 13’th. More than two weeks ago I wrote on Facebook and Twitter that I needed x amount of people signed up for the seminar to decide if I need to rent a bigger dojo before yesterday. I thought I’ll use this news list and extend the time to this Sunday evening. If you are interested to attend this seminar I want to know now, you need to sign up on the web site (I don’t accept sign ups by email, Facebook etc, only from the web site form). And you need to do it before Sunday to be guaranteed a place at the seminar. If I don’t get more than 33 people by Sunday evening I will not be able to book a bigger dojo and accept more participants. You need to understand that I’m taking the financial risks. The instructors will get paid from my own pocket if I can’t get exactly 33 paying members. And we can’t squeeze in more people in the dojo, it wouldn’t be fair to the people that did what I asked and signed up early. If you decide you want to attend late we might have filled up all places because I didn’t book a bigger dojo. If you’re high ranking or friend doesn’t matter you caused me problems. If you come unannounced and expect to be welcome you take things for granted. You could stand there and cry, but it doesn’t help the situation. If the seminar is in my dojo we have limited places, and there will be no special treatments. I’ve seen this trend more and more the past 20 years. The first seminars I organised we had ~50 people signed up three months ahead, ~10 more signed up late. Now it is the opposite which makes it difficult to plan things, and we need to change this trend back. I know there are those who can’t decide until last week, it is the same for me sometimes. But if it is a seminar I really want to go to, I sign up immediately and make sure I can attend. The art of planning and commitment seems to be disappearing. Sometimes I can’t decide until the last week, then I’ll check to see if I would be welcome. If not I wouldn’t blame the organisers or cry about it. Alright sorry for ranting but I don’t think everybody understand or take things for granted. If I get enough people that it would pay the extra rent for a bigger dojo I have no problems, this time. If I rent a bigger dojo we can accept up to ~70 people. I kinda promised free beer if there is more than 50 people. Again please sign up now! I’m doing a series of focus trainings on ROKUSHAKU-BO-JUTSU this summer. Four trainings is scheduled from June to September. For more information see the Kaigozan Web site, and the Facebook event page. If you have problems with the Swedish and want to attend, please contact me :-). This two hour DVD is packed with good demonstrations and instructions from Sveneric Bogsäter and Rob Renner. 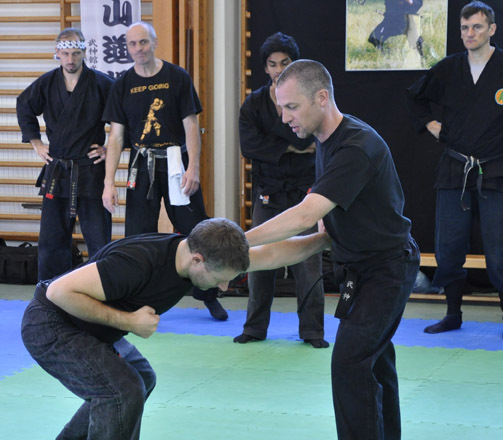 Sveneric had recently been in Japan, and Rob Renner has lived in Japan for many years, so what they taught was very much the feeling from Japan trainings with Hatsumi Soke and the Japanese Shihan. Rob taught how to understand the distance and footwork with unarmed and with a Hanbo to the whole group. At the Shidoshi class he taught how to do the Kihon-happo techniques against someone who is resisting, directions, balance breaking and distance. Against one and several opponents. Rob’s Mudansha and Yudansha class is available on download file only (click here!). This two hour DVD is packed with good demonstrations and instructions from Duncan Stewart and Steve Olsen. Both Duncan and Steve has lived in Japan for many years, so what they taught was very much the feeling from Japan trainings with Hatsumi Soke and the Japanese Shihan. Steve taught Taijutsu to the Shidoshi class and to the class with the whole big group. The Mudansha and Yudansha class is available only as download video (click here!). 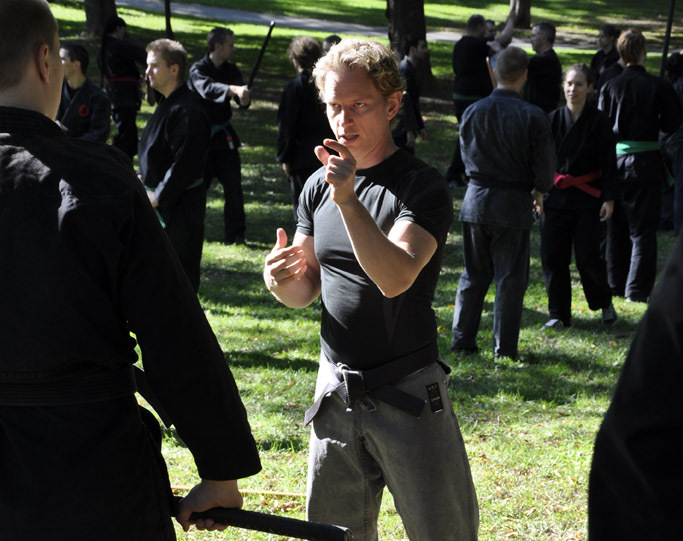 Duncan taught drills how to learn the correct distance to the opponent, and Taijutsu techniques with or without small concealed weapons. To the whole big group he taught and demonstrated Taijutsu with devastating efficiency. Unfortunately there was no footage of his Mudansha and Yudansha class. This video is 20 minute where Steve Olsen taught the Mudansha and Yudansha class (ranks below 5′th dan). He taught a little sword cutting technique but mostly Taijutsu. This video is 32 minute where Rob Renner taught the Mudansha and Yudansha class (ranks below 5′th dan). He taught footwork, distance, taijutsu and unarmed training drills that will make you understand the basics better.